Need some local grains and beans for your winter pantry? 1) There is a new Bean and Grain Booth at the Lane County Farmers’ Market (8th and Oak) for the next four Saturdays — Oct 16, 23, 30 and Nov 6. Products available include: Whole Wheat Bread Flour and Brown Teff Flour from Hunton’s Farm; Whole Wheat Bread and Pastry Flour from Greenwillow Grains (Stalford Farms); and a variety of heirloom dry beans from Lonesome Whistle Farm. Also of note: Lonesome Whistle also has a bean CSA. I bought some of their on-the-cob Dakota black popcorn on the cob a few weeks ago, and it is drying in my back room. Can’t wait to try it! 2) The first annual Fill-Your-Pantry farmers market looks like a great opportunity to interact with bean and grain farmers, absolutely worth the drive up to Corvallis. Several of these folks are converting land used for other crops (like grass seed) over to food. Yay! The prices are quite good, too. Saturday, October 23, 2010 2-5 p.m.
Purchase staples (grains, flour, beans, seeds, winter storage produce, honey, meats, canned fish, etc.) directly from local farmers and fishers. Stock your pantry for the winter. List of foods available below, including growing method (conventional, natural, certified organic or transitional to Organic) and price per pound. Orders for over 100 pounds of a single item (e.g. oats) must be reserved by October 19th. Smaller orders should be reserved as supply is limited. Or, may be purchased at event. All orders must be picked up at the event. Payment by cash or check only. Oregon Trail tokens available after 3 p.m.. Send your order to sunbow@peak.org. By Oct. 19th. Please include farm, item and quantity. Check for updates only at: www.tenriversfoodweb.org. This event is sponsored by by South Willamette Valley Bean and Grain Project and Ten Rivers Food Web. Transitioning 800 acres from conventional exported rye grass seed to local Certified Organic Bean, Grain and Seed production. Product list: Hard Red Wheat Berries-50 cents/lb Soft White Wheat Berries- 50 cents/lb Brown Flax-$2/lb Hull-less Oats: Rolled-$1/lb Depending if we get it processed in time. Whole-$2/lb ( can also be used for seed) Cayuse Oats- for feed- $40 cents/lb. Certified organic. Product List: Whole Chickens Whole chicken is 3-4 pounds. Cut into pieces or cook whole. Great for grilling or roasting. Left over bones make a nutritious and versatile stock. 2-3# $12 3-4# $16 4-5# $20. Many customers want the benefits of buying a half a cow, but do not have the freezer or eaters to make such a large commitment. So, now you can order a share that is much smaller, offering you the same diversity within each box that you would find when ordering a larger quantity. Each Beef Club Box includes: 3-4 pounds of lean ground beef (1 pound pkgs) 3-4 pounds of roast or ribs 3-4 pounds of steaks (1-2 steaks per pkg). 10# mixed beef box $65. Many customers want the benefits of buying a half a pig, but do not have the freezer or eaters to make such a large commitment. So, now you can order a share that is much smaller, offering you the same diversity within each box that you would find when ordering a larger quantity. Each Pork Club Box includes: 3-4 pounds of lean ground pork (1 pound pkgs) 3-4 pounds of roast, hams or ribs 3-4 pounds of chops (1-2 per pkg) or bacon (does contain nitrates/nitrites). 10# mixed pork box (with cured meats) $60. Many customers want the benefits of buying a half a pig, but do not have the freezer or eaters to make such a large commitment. So, now you can order a share that is much smaller, offering you the same diversity within each box that you would find when ordering a larger quantity. Each Pork Club Box includes: 3-4 pounds of lean ground pork (1 pound pkgs) 3-4 pounds of roast or ribs 3-4 pounds of chops (1-2 per pkg). 10# mixed pork box (with NO cured meats) $60. Order directly from them at www.oregonschoice.com, Pick up at the event. When ordering on-line there is no way around the shipping charges BUT they will be refunded! Please type Pantry Pick-up in the ‘special instructions’ box during checkout. The shipping cost will be refunded to your card after the order is placed. To order by phone, call 541-929-8862. Next Article …but first, the news. Exciting! I think we are putting together a group to buy from the fill your pantry event. I work 3 days a week in Corvallis, so hate to drive up again on the weekend, but it should be worth it. Thank you so much for sharing. I hope folks will get on board with the local beans, grains and winter crops, and support our local farmers who are thinking broadly about how to feed all of us here in the Willamette Valley. Yay Beans and Grains! 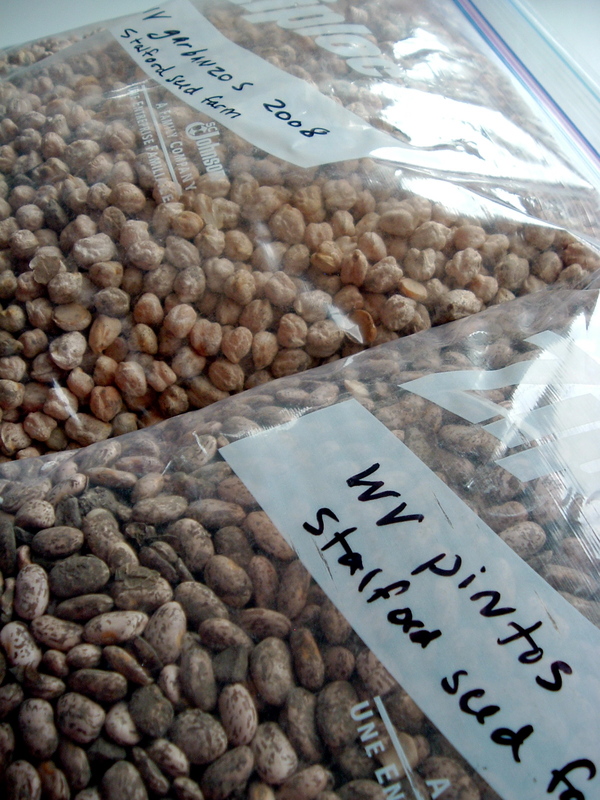 I am working on a follow up book to my first (Eating Close to Home), this one on local beans, grains, nuts and seeds. As I did with ECH, I’ll be including recipes from as many folks in our community as I can get, so after you stock your pantry (and new freezer)and start playing with all those wonderful goods, let me know of any good recipes that you come up with! I’m glad to hear you’re working on a new cookbook. Your last book, Eating Close to Home, raised money for WFFC and other great programs — thanks so much! If you like, you can search this site for “beans” for some of the recipes I’ve developed using local beans in the past couple of years. I am passionate advocate for sourcing locally grown foods, whether plant based or for the minimal amount of animal/seafood edibles that I eat. Here are some more resources to get your started, besides my earlier post on how to find local sources of pastured food.